The demonetization impact would have been painful for a few quarters, so by now we should be recovering from that damage. With those tailwinds, the 6.3% is benign. 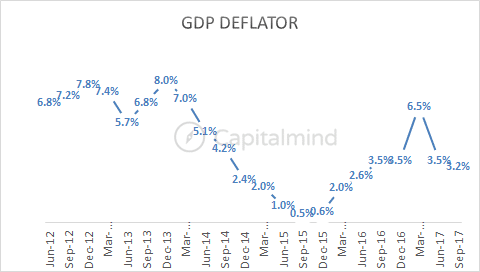 And Nominal Growth – which is what growth is before you take out inflation – is at only 9.43%. 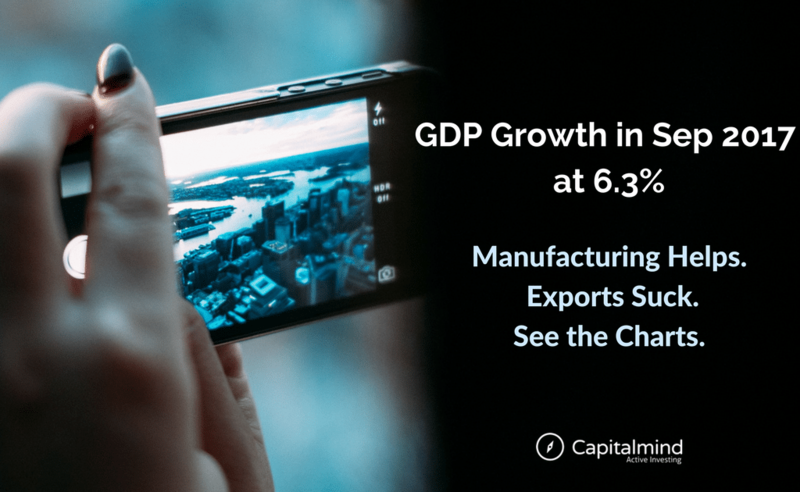 The Sectors: Manufacturing to the rescue! We would have fared badly if manufacturing had not moved up sharply. It’s true that GST had impacted stuff in Q1, so manufacturing kinda sorta halted to allow GST to come into place (it started on July 1). And then, the output would have been higher to make up for the lost time. Mining too was impressive, and this also has some kind of GST impact, it seems. 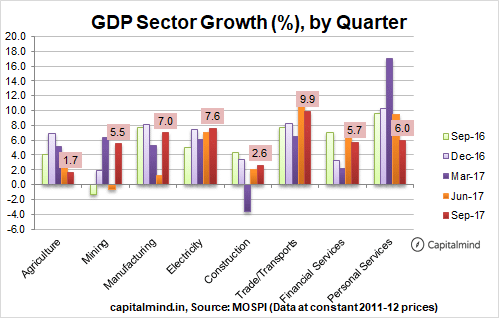 However, the growth in financials, personal services and construction have slowed. From a component standpoint, things have changed. Government expenditure, which drove a lot of growth earlier, has fallen to just 4%. 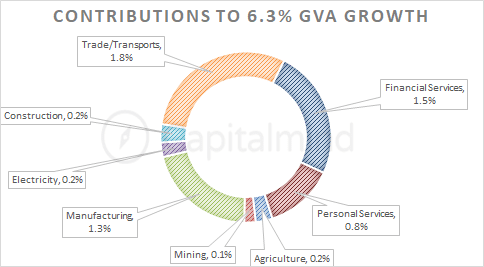 Private expenditure, the biggest part of the chain (it’s 60%+ of GDP) has been flat, and imports are up. Exports are pathetic and have been sub 2%! 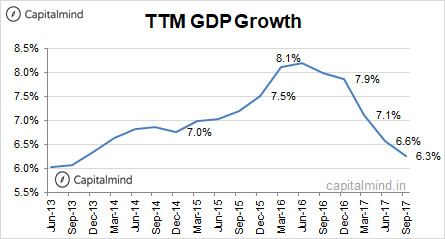 The trailing twelve month (TTM) GDP has actually been falling. We are of course at the lowest in three years, and one can make the argument that we can only go up from here. But, as a cantankerous old man, this doesn’t sound like a great argument. What helps is that inflation is falling again. At just 3.2% it’s at a near-term low. A jump in inflation can hurt growth again. And finally, Who made it happen? 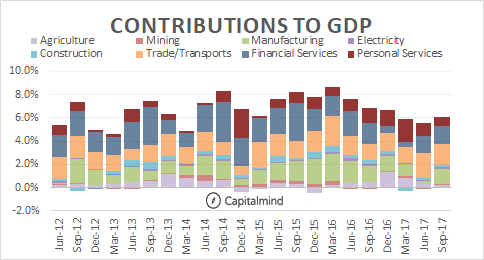 From a sector perspective, we see that Trade and Transport, Financials and Manufacturing did the heavy lifting this time. 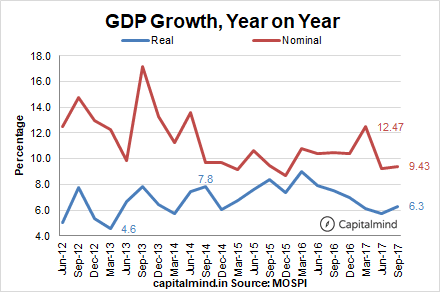 India is indeed growing, but the old time moves of 7-8% might be behind us. We might have to live with the 5-6% numbers for a while as the economy gets back on track. Markets of course will not care. It doesn’t matter if it’s even slightly negative; the rule is: only go up. So I wouldn’t be reading too much negativity into this data. It’s just so-so. 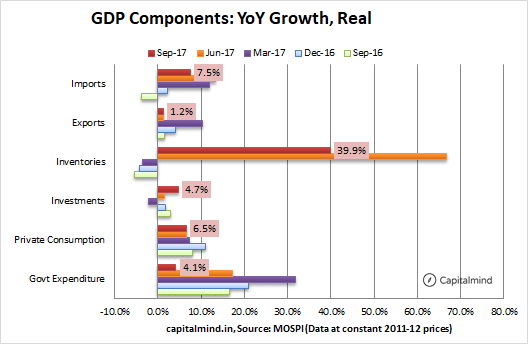 We’ll probably have to see until Gujarat elections if this GDP growth has actually translated into happiness for people. But speaking from an economic perspective, we have to fix the exports and keep manufacturing rolling.